King Hiram ruled Tyre, a port city on the Mediterranean Coastal region historically known as Phoenicia (in Lebanon) where great seafaring-people once dwelt. This was the same king allied with King Solomon and whose navy had helped to procure gold for the building of the temple in Jerusalem (II Chron. 9:21). Yet, even before Solomon took over his father’s throne, King David already amassed the gold and silver to furnish the temple through his alliance with Hiram, as he was indeed bent on proceeding with the project (II Sam.5:11; I Chron. 28:2). In fact, in I Chron. 28:10-20, he provided Solomon with all the completed building plans and the exact amount of gold and silver needed to make all the temple articles. However, God prevented the warrior-king from building the temple as he had shed much blood and had even killed one of his loyal soldiers in order to take his wife, Bathsheba. Only a person with a pure heart and pure hands – such as young Solomon (ironically David’s son with Bathsheba) – would qualify for the job. David, whose heart was “after God’s own heart”, had vowed to honor Him with a glorious temple, a rather ambitious undertaking to house the Ark of the Covenant, as well as to exhibit to the neighboring nations, perhaps, that Israel had a more powerful and more majestic God. If David then had all the precious metals he needed to build the temple, what was Solomon ferrying through Hiram’s navy for? Clearly, David had collected all gold, silver and bronze for the temple, all coming from Ophir through Hiram’s navy and his own navy. Now, Solomon was hiring Hiram to get more gold, silver, almug wood and other materials from Ophir which the latter imported within a three-year round-trip journey. That means about a-year-or-so travel-period going, another year for cutting and preparing wood and mining and purifying gold for shipping, and another year for the trip coming back. That includes, of course, buying “ivory, apes and peacocks” for Solomon’s use. What!? Did God need apes and peacocks for His glorious habitation on Earth? What was all the frivolous shipment for if David already had enough? 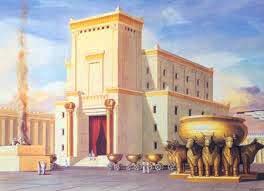 Solomon – thus, in keeping with his growing vanity – separately designed his own “dream palace” beside the temple. It took 13 years to complete; while the temple took seven years. Twice as big, twice as long to finish and, perhaps, twice — or even thrice or more — as expensive. 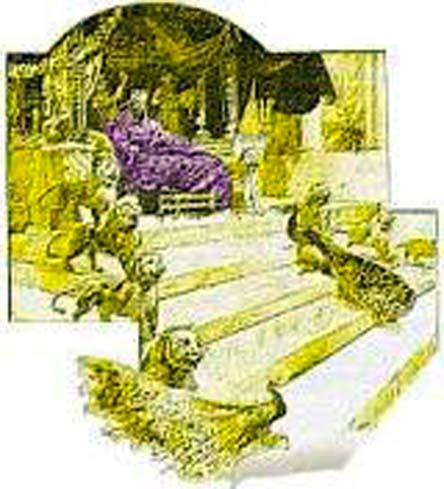 According to I Kings 10:18-22, he had two golden lions on both sides of his golden throne which was inlaid with ivory, and six other golden lions on both sides of the steps leading to his throne – 14 golden lions guarding the golden throne. Like the Queen of Sheba, we would have been overawed and left witless! And we can imagine the amount of gold he needed to furnish his opulent and vast courts and dwellings. With 700 wives and 300 concubines, imagine the gold earrings, necklaces, bracelets and anklets he had prepared to please his retinue. And he had hundreds of shields of hammered gold at his “Palace of the Forest of Lebanon” (II Chron. 9:15-16). It was not in Lebanon but made to look like a forest of cedar trees imported from Lebanon. Is this the stuff of legend or myth? Or is this fact and history we can accept beyond doubt? Many scholars claim the temple in Jerusalem never existed because we find no archeological findings to prove it ever existed. (Does this also mean there is no gold because we cannot see it in any museum? Now, who would keep that much gold merely for eyes to behold – aside from Solomon?) David and Solomon, it is claimed, never put up markers or monuments that bore their names because not even a single one remains. Forget that so many stories written in the Bible tell us of the building, the destruction and the rebuilding of the temple, once or twice over. And forget that Christ Himself saw, talked about, walked inside and even overturned the tables of the moneychangers in the temple. What have we got to see, touch or hold firmly then in order to be convinced that David and Solomon were not playing simulated-palace-or-temple-construction computer games? Unfortunately (for some), it requires faith and only faith, nothing else. Overturning those tables was merely a precursor of what God was preparing to do with the moribund temple. In AD 70, the Roman legions destroyed the temple. Where did all the gold go? When the Babylonians conquered Israel, their king, Nebuchadnezzar, took all the temple gold implements and kept them in a temple in Babylon. Later when the Persians overran Babylon, King Cyrus had them returned to Jerusalem during the rebuilding of the temple. With no gold either as evidence, how can we believe this fantastic story? The reason it takes faith to accept this is because Christ prophesied as He pointed to the buildings in Jerusalem: Do you not see all these things? Assuredly, I say to you, not one stone will be left here upon another, that shall not be thrown down. (Matt. 24:2 –highlighted) That requires faith to believe – first, the Person saying it and, second, the fact that nothing (as in zero or negative-all) will remain to be seen, touched or taken to one’s personal museum. The Romans cleaned up the whole place – perhaps, recycling the materials in order to build roads, viaducts, forts and bridges. And probably, they repurposed some big rocks for catapult ammunition against Jewish rebels, while the fancier or colorful stones were for lining their bath houses. My villa’s bath is lined with Ophir marble taken from Solomon’s palace. Who knows what glory-seeking people have in mind next? As for the gold, that is another mystery we reserve for another day. Point is: Christ spoke the truth. And yet, many still do not believe Him. Yes, He spoke of Solomon’s glory and wealth. But He pointed to His supremacy when He said, “. . . indeed one greater than Solomon is here.” If He is greater, then He has greater power, greater glory and greater wealth to offer. Yes, His wealth of knowledge can lead us to believe David, Solomon and Hiram did get gold from Ophir. Hence, if Solomon’s gold was real, so was Ophir. So where is Ophir? Since we have been mesmerized by Greek and Roman myths for centuries, let us try to get real and assume – just try to assume – that Ophir is within the realm of factual history. In order to do this, let us bring in Columbus and Magellan, famous European explorers who happened to believe in a real Ophir – or, at least, the fabled “land of gold” – and searched for it (were they not all looking for El Dorado?). Jason and the Argonauts were looking for the “golden fleece”; those Renaissance sailors were looking for gold to fleece. Well, that is what they ended up doing, on behalf of their patrons – if not for themselves. Columbus first tried to find Ophir. He based his journey on a passage in the book of Esdras which described the route that the lost tribes of Israel took to Arzareth, a country reachable through “a journey of a year and a half” (II Esdras 13:39-45). He must have equated that to King Hiram’s journey and concluded that Arzareth was in, or was indeed, Ophir. 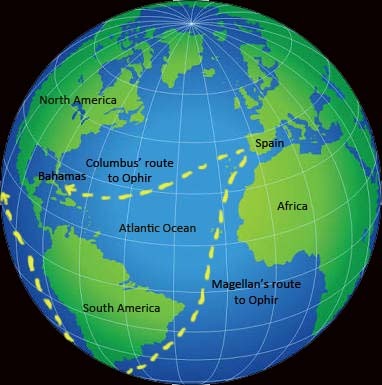 As the story goes, Columbus took the unchartered westward route across the Atlantic, following the 28th-Parallel (28° North latitude). After about two months, they reached Guanahani Island in the Bahamas. The exact location of the island he called San Salvador is unsure; but it lies within the 21st to 24th Parallel. Columbus did eventually find some gold but not of the best quality or of the desired quantity. You see, he missed Ophir by an ocean. He had landed near the Isthmus of Panama beside the Caribbean Sea. Several years later, Italian navigator Amerigo Vespucci explored other places in the “New World” or America, such as Guyana and Haiti, and practically took the thunder away from Columbus. The two made the colossal error of thinking they had reached Asia (East Indies). What they did come to explore, however, changed the map and history of the world. We must ask the question: Why did Columbus not land in South or North America at first? Because he was looking for Ophir, specifically, and not another place outside his scope. He was obviously using an ancient direction (within the 20th to 28th-Parallels, whether westward or eastward) that had somehow been passed on from the time of King Hiram and which he had access to by some means. Whether it was information he had derived from the Bible or some other previously-unknown source, it was accurate information. But the more important question is: Why did Columbus miss Ophir? Because he merely crossed the Atlantic. It took another person to correct Columbus’ mistakes and finally make it to Ophir. In 1494, two years after Columbus had landed in the Americas, the pope, Alexander VI, modified a papal Bull of Demarcation issued in 1493 with the Treaty of Tordesillas which divided the world map (with the mid-Atlantic Ocean longitude as boundary) and declared unexplored lands west of the line as Spain’s territory and east as Portugal’s. Another possibility is that both Columbus and Magellan may have been aiming for China whose location could have been documented by the earlier records of other navigators, such as Marco Polo. The ancient Chinese had been trading regularly with a group of islands that lie southeast of China which they called Ma-yi. The land had much gold, silver and other merchandise which they traded with silk and other Chinese goods. However, Antonio Pigafetta, Magellan’s chronicler, said that the captain-general had been to the Moluccas and knew its latitude bearing and, hence, took a southwest route from Guam in the Marianas. When he was quite certain they were near Moluccas, he ordered a northerly course and then swerved westward upon reaching the 13th-Parallel. This led him to Ophir. Look at the map of the Pacific and trace a path from where Columbus landed and find out where you would land at the westernmost side of the Pacific. Voila! Marianas Islands or near Guam Island. Exactly where Magellan and his remaining three ships finally left behind the vast and dreary Pacific Ocean – the bulk of it, at least. Nevertheless, it was but a much-needed respite for the rat-eating and scurvy-infected crew. They merely resupplied their food and water in those islands. 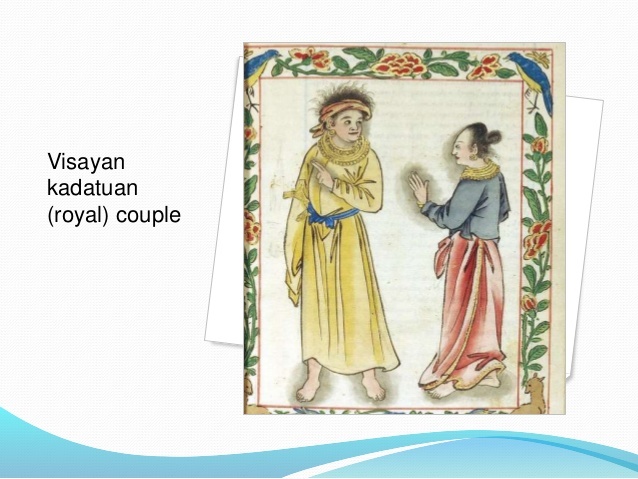 On board was Enrique, a slave whom Magellan had acquired in his previous trips to the Spice Islands of Moluccas, who spoke Bisayan and claimed to be a native of Ophir. He had served Magellan well up to that time. Enrique must have provided more specific directions to the fleet, which finally landed on an island south of Samar – near the 10th-Parallel on March 17, 1521 (not 16, since the East is a day ahead). Was Magellan’s choice to retain a slave from the place he was aiming for all along pure luck or a tactical move that paid off well? Did he convince the crown to finance his journey merely through words and science or with flesh-and-blood evidence that Ophir was not a myth but a living place? Since Enrique — or “Black” Henry who was actually brown – originally worked in Moluccas along with other people from Ophir and dealt with the Portuguese, he must have spoken Portuguese and, perhaps, Spanish, in order to speak with Magellan. What Enrique had seen and what he knew convinced Magellan first and then the Spanish king. (A human is always better than a book. More so if Enrique smiled often and showed his teeth covered in pure gold, as was the fashion among his people.) Only a consummate enterpriser using such an approach, as Magellan may have done, could have been able to sway a monarch who was more than eager not to repeat the Columbus-Vespucci fiasco and, thereby, recover lost investments, aside from gaining so much more. Considering further that Ophir and its gold lay in the Portuguese half of the globe, violating a papal bull was worth the risk. Just south of the island where they had landed lay the province of Surigao where recent diggings show that the ancient inhabitants of that place had an abundance of gold.2 Pigafetta wrote that natives in Ophir wore gold necklaces, bracelets, waist bands and anklets with the same craftsmanship as those found in Surigao. Even the alipins or slaves and warriors had them. (The Chinese rendered this fact in several Boxer Codex paintings showing the royal-looking natives arrayed in much finely-crafted gold ornaments and wearing red or blue clothing.) In fact, in the months that the visitors dealt with the natives, gold was deemed less valuable than the goods the Spanish offered them. Thus, they preferred to trade gold for a knife, for instance, instead of precious jewelry or velvet. He also heard stories of the natives simply picking up gold nuggets on the river beds the size of walnuts or eggs. Columbus never had such luck. Nevertheless, Magellan ordered his men “not to show too much interest” in the gold and reminded them to reserve their goods for spices which were what they had come for, as stipulated in the contract: Bring back so many pounds of cloves and so many vats of oil, etc. As for the gold, it was a dream Magellan had shared with Columbus. He was now definitely looking at the gold. But as a wise and patient conquistador, he had to play politics, as well as religion, in order to make a more lasting and more profitable venture in the end. Thus, he went about converting the people to his religion, although the natives worshipped their God Aba or Abba by raising their joined hands and looking up to Heaven. Yes, they had anitos or wooden idols; but so did the Samaritan Israelites who claimed to worship Yahuah/Yahweh but also had Baal images. Magellan was also clearly a psy-war expert, showing the power and efficacy of his cannons and rifles, as well as their invincible steel armor, through harmless demonstrations during festivities. These Indios cannot fight us with their bamboo lances, arrows and bolos. We will make them docile Catholics by replacing their anitos with the cross and images of Mary and the baby Jesus. And they will pay tribute to the Spanish monarch whose authority and beneficence has given them the privilege to become his obedient subjects. This is what Magellan sought to achieve right then and there when he realized he could possess Ophir and all its wealth and rule its people on behalf of Spain. 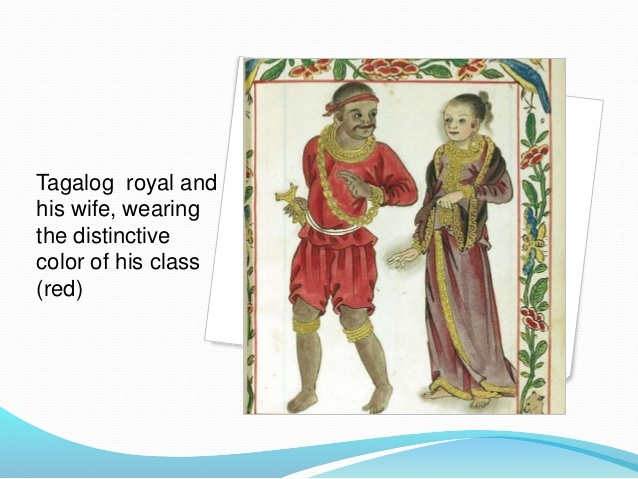 He had initially read a book written by a contemporary named Duarte Barbosa mentioning “white bearded men” known as Lequios who lived on an island between Mindanaus (Mindanao) and Taiwan – most likely Luzon (referred to as LEQUIOS, from which ILOCOS may have come from). Could they have been descendants of the early Phoenicians or Solomon’s servants who worked for Hiram? Those people traded much gold and silver and other merchandise, such as silk, grains and pearls. Magellan was said to have replaced the name Lequios with “Ophir and Tarshish” in his version of the book, proving further that both he and Columbus clung to the story of King Hiram and, therefore, had the same source of indisputable information – the Old Testament. Although they read the same books as primary sources, Magellan had a brown ace up in his helmet and knew exactly where to go. Whereas Columbus failed in his search, Magellan attained more success as a captain, navigator and administrator than any other person had ever done since the time of King Hiram – at least, up until that time. All the gold of King David and King Solomon had shipped came from these islands Magellan found and it was now within his power to directly possess, rule, and control way beyond any monarch could have hoped to accomplish. As governor like Columbus was, he could build his own small kingdom far from the reaches of any Italian, Portuguese or Spanish ruler. Who knows how many islands lay around these islands for his taking? With all the gold to finance his personal dreams, he could give part of it to the crown to maintain his position as governor and be free to use the rest and rule as David and Solomon did. Perhaps, this entered Magellan’s mind not just for himself but also for his hardened crew who had remained with him and served him with dedication. He had established a foothold for Spain in the islands with their help. Then again, he could have remained a humble and obedient subject and did what he needed to do: “Subdue” the people and the islands (as Adam had been commanded in the Garden?) and rule it under the Roman crown (King Charles V of Spain was also Emperor of the Roman Empire) and the Catholic cross. The message of Christ’s love and compassion remained practically a mere slogan upon the banner of his overarching role as duly-authorized overseer of the islands. The sword, cannon, musket and armor were there for material conquest. The cross was there for religious compliance. Either way, Magellan’s word determined the law of final conduct for all those who were under his sway and command. Consider how Magellan would have imposed punishment on rebellious natives: by beheading, execution by musketry or by crucifixion? A loyal general of the Roman Empire would scarcely think of using a very tame method as the last one. Besides, it would have been against his religion. Based on the Spaniards’ actuation, true conversion and genuine liberation through the Gospel Truth never entered the picture from that time on. In reality, the giant crosses they erected all over the islands were subtle warnings that anyone who refused to comply and pay tribute to Spain would cross the crown and, well, the cross. From one form of idolatry to another, from one form of religion to another, the natives were merely led about for the sake of a global power’s ultimate colonial aims. Whereas the natives had worshiped God by merely raising their hands, they now had to kneel before a menacing cross, a dumb idol and in front of a mere man holding a piece of wafer, something that Christ and His disciples neither taught nor practiced. And remember, the year Magellan landed on these islands was the very same year his religion was being repudiated in Europe by the enlightened reformists. 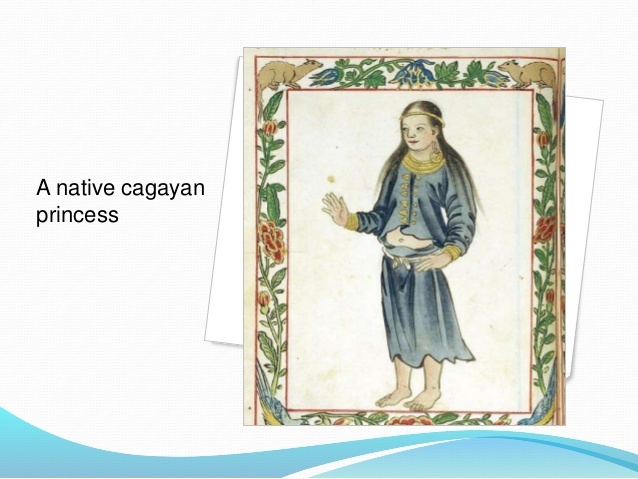 Rajah Humabon, King of Cebu, turned out to be a willing subject and partner, eager to see how Magellan would defeat uncooperative chieftains, such as Lapu-lapu. 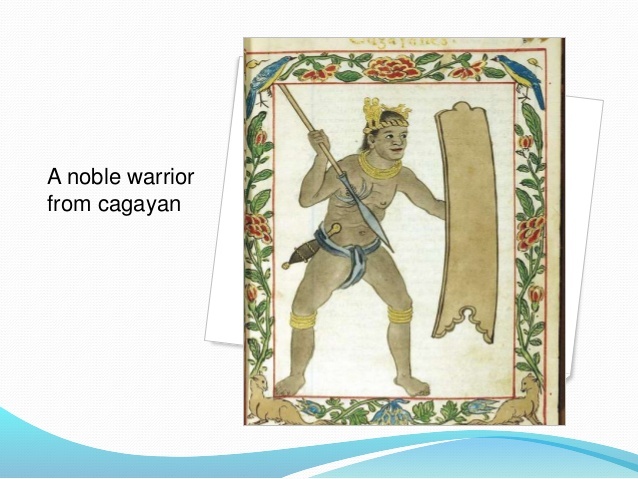 Thus, he joined Magellan in the dawn attack on the island of Mactan with his own retinue of Cebuano warriors. The patent divide-and-conquer method of managing a colony came to be applied that early on by the masters of colonization. Confident of his own military invincibility and eager to wield his newly-acquired political power he had come to enforce, Magellan led the attack on April 28, 1522. They arrived at early dawn and sent an emissary to order Lapu-lapu’s surrender. The Mactan chieftain refused but requested not to be attacked at dawn, playing a ruse that they were waiting for more warriors to join them. Still pumped up for his first chance to discipline natives and to show again his resolute will which had effectively crushed a mutiny back in South America (by executing the leaders through beheading), he rejected his own men’s plea not to join the attacking force and disregarded the obvious ploy of a “panicked” indio begging for more time. Before sunrise, the attack began just when the tide had receded (part of Lapu-lapu’s ruse – Attack now while it is low tide!) and made the Spaniards wade toward the shore for quite a distance, hampered by their heavy armor and wide open to attack. The natives had hidden sharp bamboo lances in trenches under the sand along the shore to welcome the enemy. From afar, the muskets could hardly penetrate the wooden shields of the defenders. Those who were hit by bullets became even fiercer and rushed forward at the enemy. With their unexpected and effective defense, Lapu-lapu and his men brought the invaders into utter confusion and bore upon them with a three-pronged attack: from the left, the right and the center, engaging the enemy with arrows, bolos and lances. They also used rocks and mud as weapons against the enemies. Seeing their lances and arrows were ineffective on the steel armor, they then aimed at the invaders’ vulnerable arms and legs and did much damage. The 49 attacking soldiers faced 1,500 native-defenders in a battlefield clearly familiar and controlled by the latter. (It would seem like they were merely catching fish – although aiming at much bigger ones covered with metal – an ordinary skill they had learned since childhood.) Modern weaponry could not overcome the sheer number and courage with which Lapu-lapu and his agile men fought. Although Magellan ordered two men to burn the houses along the shore to distract the defenders, his ploy only angered them even more. Many were soon ganging up on the recognized leader, Magellan, who fought valiantly to the end. The 11 men left behind to guard the small boats and those who were able to escape could only watch as their commander fell and expired. Magellan died with his unfulfilled dreams of enjoying the potential wealth he had unraveled. He did find Ophir, at least, and realized it was both Paradise and Hell. He found it a Paradise indeed. But turning it into a Hell was his first and last mistake. In God’s mighty rule, nobody conquers and despoils any nation, least of all His precious nation of beloved followers, and not reap His wrath in the end. What we read and hear today are mere stories or histories told, written and even hidden from us for a while; but those who truly seek the Truth will be set free in time and indeed. Ophir remains essentially as it was for the four centuries it has been conquered and ruled by supposedly-benevolent powers. Whereas Hiram, David and Solomon treated Ophir as a lover would treat a treasured beloved, others enslaved and oppressed Ophir through their greed, hypocrisy and violence. When it is time to rise up in judgment, the One who is greater than Solomon will avenge Ophir and vindicate him before all the nations. Why was this historical truth withheld from the people who needed to know it most? Not even one textbook, magazine, movie, docu-film, article or poem was ever published by any institution, administration, religious group, corporation or association for the very purpose of informing the masses of this fact, until recently. Rizal, Paterno and others tried to bring out this truth, but were never given much credence. Why? Who caused our eyes and minds to be so blinded? Where is all the gold of Ophir now? Gold neither tarnishes nor decays. And nobody throws gold away but stores it. Whoever has the gold of David, Solomon and Ophir owes it to God and His people to make a proper accounting. Not to determine how much Ophir owned or owns but how much was owed to him during the time it was taken away from him; not in terms of the weight of gold but in terms of the loss and suffering inflicted. Then, the Judge of All will measure back the corresponding payment. In the next articles, we will deal with these mysteries. Collecion General de Documentos Relativos a las Islas Filipinas, Pedro Torres Y Lanzas, Vol. 3, Documento No. 98.